Ever heard of telemedicine abortion? While it's not at the very forefront of reproductive rights (yet,) telemedicine abortion is an hot-button issue in several states. 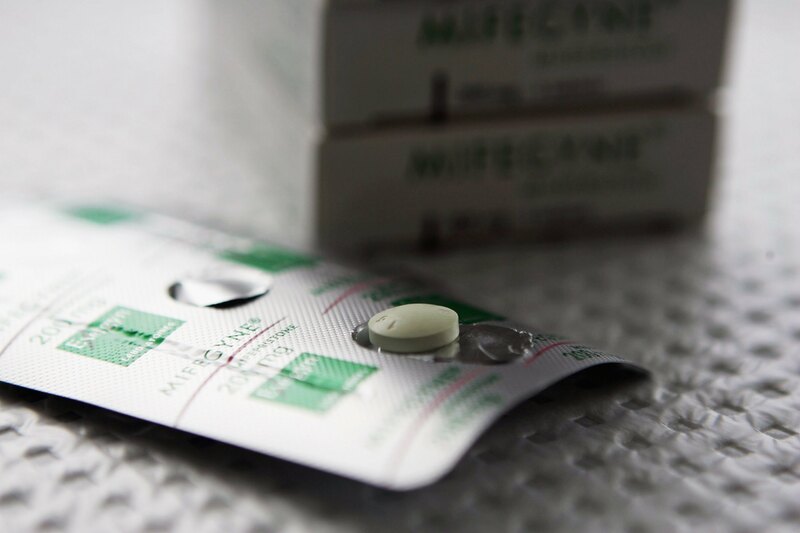 On Wednesday, an Iowa legislative panel approved a measure that would ban the remote distribution of abortion pills. The bill seeks to outlaw telemedicine abortions, in which doctors can meet with patients via video chat, administer virtual counseling, and prescribe an abortion drug. In 2008, Planned Parenthood of the Heartland doctors were the first to implement the practice. They've since performed more than 5,000 abortions in the state with telemedicine, using the drug RU-486 for women who are up to nine weeks pregnant. So how exactly does it work? Well, patients get an ultrasound from a technician along with abortion information, and they can later speak with a doctor through video. The drug is prescribed remotely and there's no surgery involved. And it's something that a lot of women are totally fine with. A recent study said 94 percent of females who chose telemedicine reported that they were "very satisfied" with the procedure, and three-quarters of women said they didn't prefer having a doctor in the room. The method also gives an alternative option to those who may be far from medical care facilities — a demographic who would be severely impacted by the bill in Iowa. "Another really insidious dynamic to this issue unfolding in Iowa is the implications for economically disadvantaged women," the health editor of ThinkProgress, Tara Culp-Ressler, tells Bustle. It's a broad trend in abortion fights, particularly when it comes to separating out abortions from taxpayer funded services. When we have these discussions, we need to be talking about these moves. These attacks on reproductive rights are directly targeting poor women who don’t necessarily have a wide range of options or access to clinics or providers. While other states practice telemedicine abortions, the issue in Iowa is particularly important since the area piloted the program, along with countless research projects on the matter. In a similar vein, Arizona, Kansas, North Dakota, Nebraska and Tennessee have passed laws limiting the method. Anti-abortion legislators in Iowa are also pushing for the bill to pass. "If I could stop all abortion in this state, I would,” State Rep. Matt Windschitl said, helpfully. This battle has been brewing for a while. Lawmakers have repeatedly tried to ban telemedicine abortions in Iowa. In Aug. 2013, Iowa’s Board of Medicine voted to ban the process. Planned Parenthood challenged the ban, and a district judged ruled in Planned Parenthood's favor. But it's a fight that's far from over. Planned Parenthood is still awaiting a final decision on the matter — a ruling that will impact the future of telemedicine abortion programs across the country. If Iowa’s program is halted, that will carry even more weight than the recent rash of state laws designed to target telemedicine abortion. There will be legal precedent for squashing this type of clinic program for good. Such laws are deemed threats to reproductive rights, but the real danger comes in their ambiguity and the fact that they are not as widespread as issues like six-week abortion bans. As long as such legislation and technicalities fly under the radar, these state-contained debates have the potential to severely impact women throughout the nation.